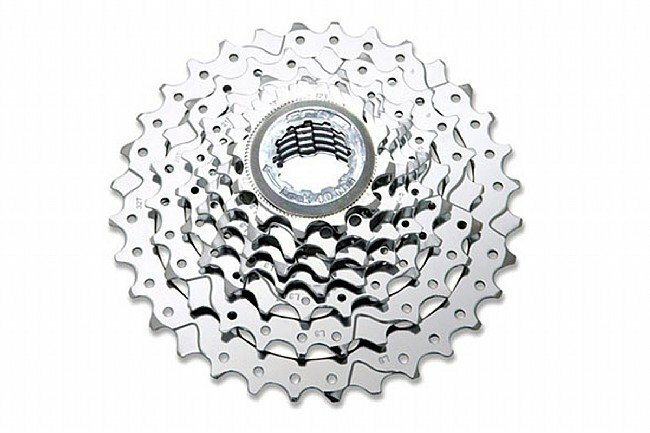 The SRAM PG-730 7-Speed Cassette is a reliable, affordable cassette designed to minimize weight without impacting performance. Constructed from durable heat treated steel cogs with weight reduction windows, the PG-730 weighs in at just 302 grams. 12-32t only. Compatible with 6/7/8-speed chains. For use with standard Shimano 7-speed freehub bodies (non-compact spacing, Shimano splined). This cassette can also be used with Shimano/SRAM 8/9/10 freehub bodies when installed with a 4.5mm spacer. I changed out a higher geared cassette as I cannot push the big gears any longer. I did need to change to a long cage RD. I am a novice and had no trouble making this repair. Works perfectly. I use this for commuting. I actually have a 24 speed bike, so I just use the sprockets to rebuild my cassettes. Very economical. Lasts at least 6 months in the worst conditions of neglect and wet riding. I like that the sprockets are chromed, as most inexpensive cassettes have black finish. Because I commute by bike, I go through a couple of these per year. It is a good quality product at a low price.